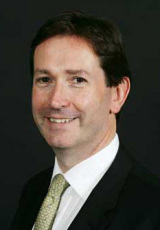 Mark McCafferty became the chief executive of the Premier Rugby Association in 2005. Premier Rugby is the body that governs the 12 Guinness premiership clubs, and as such is at the very core of rugby in England. Recent divides in the "club v country" debate have only served to emphasise the sway that the group has in the professional game, with the recent world record attendance for club games at Twickenham also highlighting their importance. McCafferty succeeded Howard Thomas in 2005, having previously enjoyed success in the consumer sector. After spending the early part of his career with Midland Bank he spent eleven years with the Thomas Cook group. Following this McCafferty joined Avis, where he remained until leaving in 2003 to pursue private investments. His appointment in 2005 left the door open to improve the commercial footprint of the Guinness Premiership, with his expertise in branding being an important part of his suitability for the job. A lucrative new deal with Guinness and new levels of exposure from Sky have been hallmarks of the success of Premier Rugby in exploiting the gains to be had in the modern, professional era. Under McCafferty the Guinness Premiership has gone from strength to strength, despite criticisms from certain quarters over the influx of foreign players and the immovable stance employed over international commitments. McCafferty also serves as commercial chairman of the ERC, the body that governs the Heineken Cup and European Challenge Cup.